As recently as last year, the revelation that House Aventus is a direct descendant of Phlan's princely line, the Valjevos, shook the city. Lord Denethen's son, the long-lost Sellent, has returned to Phlan and claimed the throne of his ancestors. He ceded House leadership to his sister, Mariana, who ran House affairs for a decade or more already. Based in the Harbor district of Phlan 'The Sentinels Of Aventus' have extensive commercial maritime holdings and also partial or complete ownership of various bars, inns and watering holes in the city. Mariana Aventus, the Lady of the House and daughter of the founder Denethen, is a former bounty hunter, and the House supports such activities often. Aventus agents' carry a reputation of being dangerous and are particularly disliked by those operating out of the shadiest corners of the city. An attractive, strangely quiet lady in her early 30's. She has a very slight frame and her blood red hair is normally fastened up in a ponytail. She is reluctant to talk about the history of her family's storied past and is quick to change the subject if and when it comes up. Mariana was approached by former City Watch Officer Erril Lesset soon after she took over as head of the organisation from her ill father. He was impressed with the 'professionalism' Aventus showed, and used his contacts to get them established as a prominent organisation within the city. 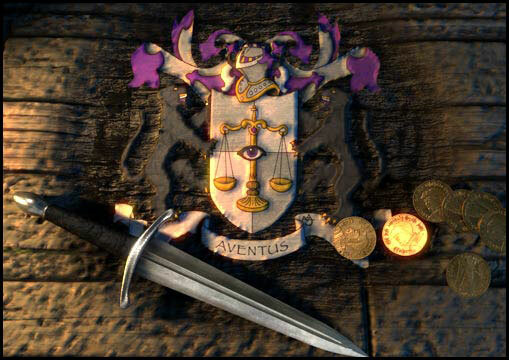 Thus The Sentinals Of Aventus was born. Mariana has surrounded herself with aides, helpers, assistants and the like to assist her with the day to day running of the busy organization. In 1381 she has married longtime fiancee Volod Yurigov, cementing the alliance of the two families; she is currently expecting her first child.